The North side of Capri offers little in the way of anchorages, but there were a couple of megayachts anchored right in front of town, so we parked in between two of them, in 120 feet of water. We then spent the afternoon in idleness, watching the world go by. From neat Sant'Angelo, to run-down Ischia Ponte, to upper-market Lacco Ameno, Ischia covers all bases, and offers good anchorages in all three. A cross-roads of history, it seems every Mediterranean culture has left a bit of its imprint on this remarkable island; not coincidentally, what is probably the oldest surviving writing in the Greek alphabet was found here. A place to go back to, someday. The Aragonese Castle at Ischia, with Peregrinus visible at anchor in the artificial bay created by the causeway built by King Alfonso V of Aragon, Naples, Sicily and diverse others, and uncle of King Ferdinand the Catholic, he who sent Columbus looking for the Indies. 9 September 2016, iPhone 6 Plus. Octavian's best friend, general and all-around master builder, Agrippa, built the port at Pandateria, now called Ventotene. The port still stands, repaired, but unaltered from the way Agrippa built it. Motoring into this harbor was the highlight our visit to the Pontine islands, and meandering around the city above, looking for mementos and gossip of his wife, known libertine, Ventotene exile, and daughter of the Emperor, Julia the Elder, was pure fun. Original breakwater and quays by Agrippa, circa 25 BC. Among many other feats of engineering, his men built an earlier temple at the Pantheon, and this is why that church in Rome still reads, even today, in large letters: "M•Agrippa•L•F•Cos•Tertium•Fecit," or, Marco Agrippa, son of Lucius, built this during his third Consulship. 7 September 2016, iPhone 6 Plus. The Admiral loves the these FitFlop shoes she bought in Ponza, the old Roman island of Pontia. It is said the Greeks may have had a colony, long before the Etruscans and then the Romans arrived; it is said this is Circe's island, where Ulysses spent a year drinking and feasting. The owners of the shoe store said Caroline Grimaldi, of Monaco, is an annual visitor and customer of theirs. Ponza is a low-key place we liked, a place where myth can be difficult to discern from reality. A place where one might very well spend a carefree year. Ponza, 6 September 2016. iPhone 6 Plus. Sailing around, Peregrinus comes across things. On January 15, 2015, this boat passed us on starboard, as fast as if we were standing still, as we approached the Fort Lauderdale inlet, on the final leg of our trip from Nova Scotia. They were rushing for the starting line of the race to Key West, which started about 15 minutes after they reached the staging area, just as we turned into the channel. Talk about cutting it close. Rambler 88 went on to win 2nd place. Forward a year-and-half later, September 3, 2016. 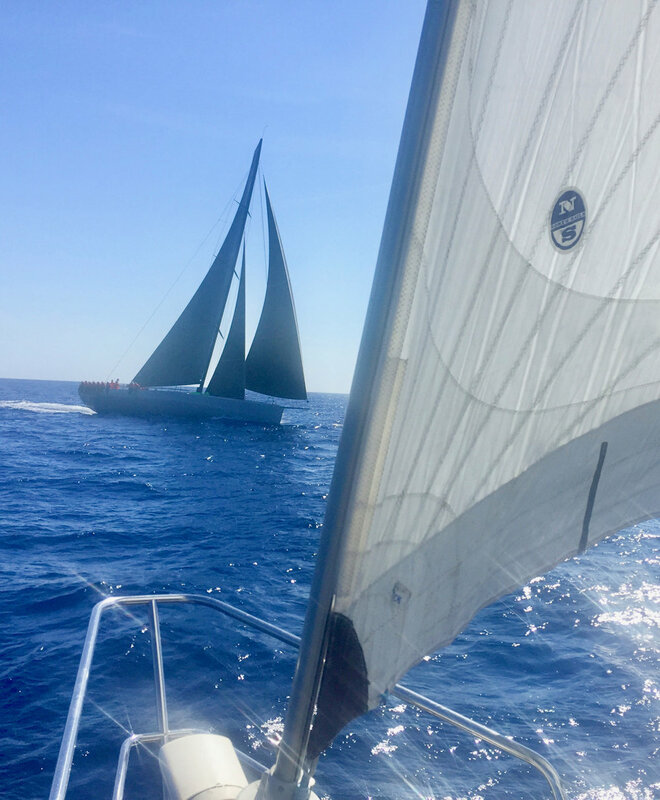 As we departed the Costa Smeralda en route to Ponza, the whole fleet of the Maxi Yacht Rolex Cup 2016 was coming out of Porto Cervo for training just ahead of the regatta that ran 4 to 10 September. Rambler 88 again passed our starboard, only this time, in the opposite direction. They didn't do all that well this time; so Peregrinus is probably not their lucky charm. Click the bar at the bottom for more photos, including one of Lionhearted. Rare photo showing most of the Peregrinus micro-fleet: the stand-up paddle board, the kayak, the sailboat, and, in the foreground, the 2.85-meter Zodiac tender. Not shown: the Achilles LT-2 2.2-meter tender. At Isola Budelli, La Maddalena Archipelago, Sardinia. 31 August 2016. We were shadowed. The 20th of August, they were the boat looming immediately next to us, at anchor, in Golfo Pevero. The 21st, as Peregrinus sat unsuspecting at Porto Liccia, they passed us by. Not once, but twice. The 22nd, we anchored at Cala di Volpe and after dinner at Baretto, what did we find as we tendered back aboard in the dark night? The Russians again, this time anchored not a mile away. The 23rd, we thought we had gotten away, as there was no sign of Russkies at Golfo Aranci. Free at last! Not so. As we steamed up the canal into Olbia on the 24th, there they were, right on our tail, and gaining on us. Full speed ahead! We only lost them by heading to the old fishing port, too shallow for them. They went into the commercial port, and stayed in town for the next couple of days. Dilbar, the Russian boat, is the largest yacht in the world by volume, and the fourth by length. Maybe next time someone shadows us they'll use a more subtle vehicle. Objects in rearview mirror are closer than they appear. Dilbar hot on the heels of Peregrinus, and gaining! Port of Olbia access canal, Sardinia, 25 August 2016. iPhone 6 Plus. August in Porto Cervo. Rush hour happens twice a day: half-past noon, and six o'clock in the afternoon. At six o'clock, there is a mad rush to return to the docks, and get ready for cocktails, dinner, and parties. Of course this means getting up in the morning is best left to the yacht crews and other hired help, who are seen running around from soon after sunrise, cleaning decks, polishing windows, and provisioning fresh delicacies at the mini-market by the Costa Smeralda Yacht Club clubhouse. Their employers only start to roll-out of their cabins by late morning, so it takes until after high noon for the mad yacht cavalcade out of port to start. On this rather random photo, almost a dozen yachts are gunning their engines on their way out and Peregrinus' Zodiac tender pretty much had to get out of the way, or get run over. Porto Cervo, 12:27 PM, 19 August 2016. iPhone 6 Plus. We saw this guy sailing in front of San Marco, across the entrance to the Gran Canal, right by the Punta de la Dogana, and carry on all along the Dorsoduro fondamentas. Full sail, course steady, and let the vaporettos and the sightseeing boats get out of the way. Venezia, 4:14pm, 19 February 2017. Leica Typ 114.